Broysan Planus Macerator Problems In London? Call now for quick professional repairs carried out in or out of warranty. 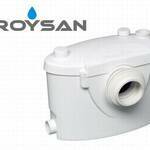 Broysan Planus Macerator Approved Service Repair Engineers London. Should your macerator pump develop a fault or gets blocked rest assured help is at hand, we can fix all macerator problems fast and efficiently. We normally offer a same day service or next day subject to availability, call now for help and expert advice for customers in the London or Hertfordshire areas. If your macerator is in or out of warranty we can help you with a repair, replacement or unblocking, normally all it takes is one site visit. We Cover, North London, East London, Central London, Some South London, some Hertfordshire areas. Warning: Do not call out an ordinary plumber or a company that does not carry spare parts for your Broysan Planus Macerator Pump or offers no fix no fee repairs as they probably have no intention of fixing or unblocking your macerator pump for you. They would rather remove a normally repairable macerator pump and charge you for a new one because it is easier to do or they don’t have the expertise to fix it. Broysan Planus Macerator Pumps will last many years if looked after properly, please read the booklet supplied in the box which shows how to care for your macerator pump. Foreign objects are a problem for all macerator pumps regardless who they are made by, so please do not flush foreign objects down the toilet as all macerator pumps are only designed for toilet tissue and human waste, anything else could block the machine. Broysan Planus Macerator Pumps will need descaling 2-3 times per year if you live in a hard water area using a phosphoric acid based descaler, using bleach or normal kettle descalers will not descale your macerator pump just merely freshen it up. Excessive use of toilet chemical cleaners can shrink rubber parts on any macerator pump and affect performance. You are allowed to clean your toilet with bleach, toilet duck and other toilet cleaners on the market. If using chemical cleaners you can leave them in the toilet for about up to an hour after cleaning then flush the toilet to remove any traces from the macerator pump. Where can I buy Descaler? On the top right of our page there is a link which directs you to suppliers of phosphoric acid based toilet descalers or click the link below. use a minimum of 2.5 litres for each descaling session for best results use up to 5 litres for optimum cleaning. Do not use for any longer than 2-3 hours or you may damage the machine. Broysan Planus Macerator Top Tips to get the most from your pump. A Broysan Planus Macerator Pump can only be used with waste pipes from 22mm up to 32mm, we recommend using 32mm if possible. All pipe work should have 45 degree bends with a minimum of 1% fall, any 90 degree bends will put strain on the pump and invalidate your warranty. Using 45 degree bends helps with the flow of water, reduces pump strain and allows drain snake unblocking should the pipe get blocked at any time in the future. If you use 90 degree elbows it makes rodding the waste outlet pipe impossible to do and the waste outlet pipe will need to be replaced. 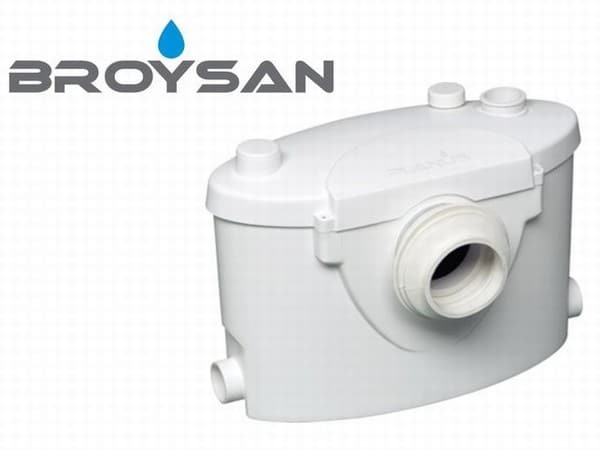 Broysan Macerator Pumps can be used to add an additional toilet, shower, bath, wash basin, dishwasher or washing machine in your property with ease. the pump allows a maximum of 8 metres vertical lift and up to 100 metres horizontal fall to the nearest soil stack. We recommend you stay well within the limit’s and do not go outside these parameters as it puts strain on the motor and will invalidate your warranty. Do Not: Use any drain unblockers to unblock your macerator pump as it can destroy an otherwise repairable pump. Your macerator pump relies on the motor turning to pump out waste water, if the pump does not turn the waste water will stay in the box, using drain unblockers will be evident and invalidate your warranty. Broysan Planus Macerator Pumps are for domestic use only, if used in a commercial setting it will invalidate your warranty. Any foreign objects put down the toilet puts unesessary strain on the motor and invalidates your warranty. Do not use chemical solvents to clean paint brushes or other items as it damages the rubber parts and invalidates your warranty. If you look after your macerator pump using our tips above your machine will last for a very long time.